Motifs are of various sizes and will be different based on your yarn/hook combinations! This pattern collection is free on my blog, but you can download the $2 PDF pattern here to go ad-free! Tiny Happy Crochet is a collection of eight darling crochet motifs that will sweeten up any project for little ones or the young at heart! 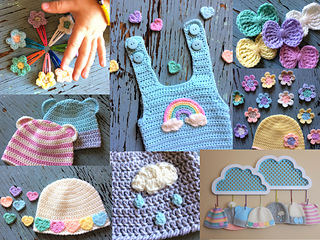 You can sew them to simple garments and accessories for a touch of whimsy, create charms for precious buntings and nursery mobiles, or attach them to hair clips and greeting cards for a dear handmade touch. My three-year-old daughter enjoys playing with them fresh off the hook. They’re just fun to have around! Various amounts and colors of #3 Light (DK weight) yarn. Feel free to use any weight yarn you desire. 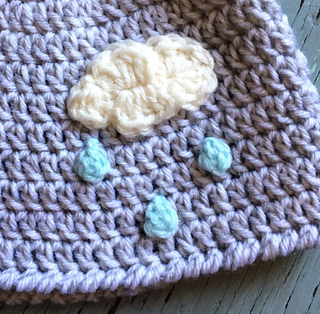 Just change to an appropriate hook size—check yarn label for guidance on recommended hook sizes if you are unsure. You need very small amounts of yarn for the individual motifs. I recommend buying an assortment of colors, and have fun playing around! You’ll get LOTS of motifs from a few skeins of yarn. See Yarn Substitutions above for guidance on hook sizes. As with any crochet project, you should adjust hook size until you are happy with your fabric. Abbreviations and any Special Stitches used follow each Sweet Motif along with a crochet symbol chart and chart key.